Hamster cages. 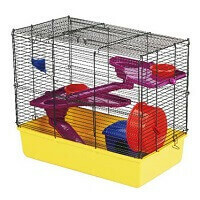 Cages for hamster and gerbils. Pet-bliss, Ireland, a complete pet shop online. Looking for hamster cages for sale in Ireland? Our wide selection of wire and plastic hamster cages come in a variety of shapes, sizes and styles, to suit your pet and the designated cage area in your home. Hamsters also enjoy cage bling like hammocks, plush bedding and chew toys. 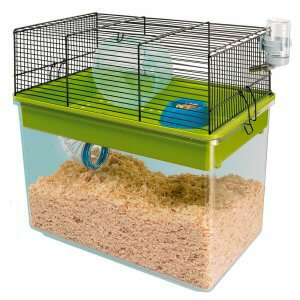 A good hamster cage is well-ventilated, easy to clean, safe and comfortable. When buying a wire-top hamster cage, you should inspect the cage for the appropriate gap size, as the smaller gap prevents them from squeezing through the bars. 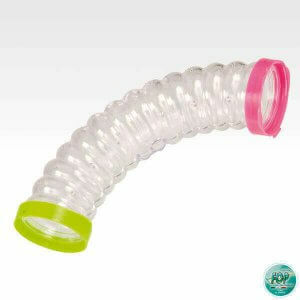 Think about easy access to your hamster, good ventilation, and ease of cleaning. Hamsters tend to kick bedding out of a cage too so bear that in mind.